The first thing I did with Fish Feaster was make solid colored boxes in MS Paint to prototype. 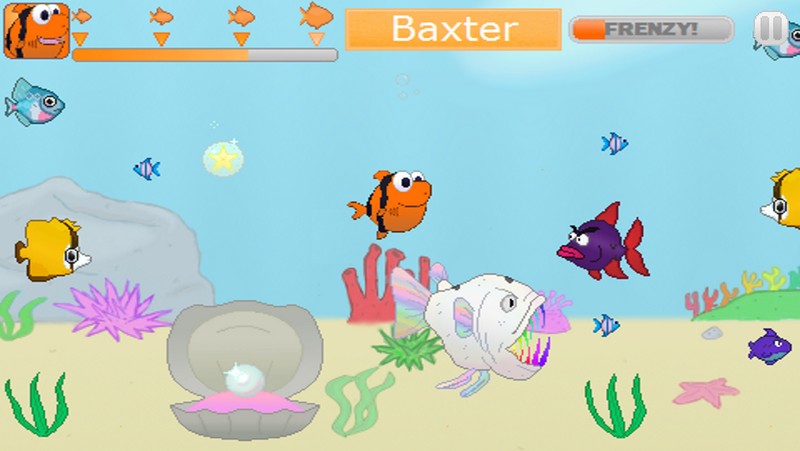 The actual fish graphics were made after I had the game working perfectly. It was a long and tedious process, and one I won't let myself fall victim to again, and I'm very pleased with the end result. 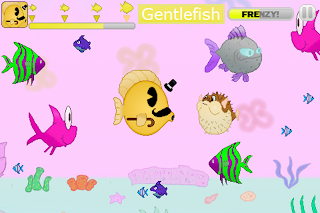 A cute fish game that's fun to play. Find out how it came to be below the break. Before I started making the game I knew I needed to settle on a fluid control scheme. Other Feeding Frenzy style games on the app store were plagued with poor controls and I wanted my game to be fun to play, the best on the market actually. I found virtual joysticks and D-pads annoying for this particular type game and accelerometer based ones were unforgivable. One control scheme I did like was a touch based one. The fish was wherever your finger was. With touch controls as a starting point, I expanded on the idea by having the fish follow where the player touches instead of being a 1-to-1 action. The fish would accelerate and reach a top speed based on how far it was from the touch, then slow down as it got closer. The end result was a fluid and realistic swimming movement that felt great to control. As for AI, I decided to use simple AI that moved from one side of the screen to the other, only interacting with things it collides with. If it hits a smaller fish (including the player) it'll eat. If it hits a bigger fish or bomb, it dies (tragically) and if it hit a jellyfish it would be stunned and not be able to eat. After planning out the controls and enemy movement patterns on paper I coded it and used colored squares the size of each fish's hitbox with arrows showing the direction it faced and a face to show that the animations were working. With basic gradients as the backgrounds I had a nice prototype going which let me test out mechanics and have something to show people when they ask what the heck I've been doing all this time. Having a prototype to play with is one of the first milestones that feels incredible. Your vision starts coming to life in front of you and you just need to give it love and grow it into the real deal. After having the prototype working well and tested on a device by my friends for feedback (which was very positive) I built a menu to lead into the game and a basic GUI interface then began making the smaller aspects of the game: frenzy meter, level select, difficulty tweaking, and collision box adjustment. After my whole game was set to go I added the final ingredients, graphics and sound. It was a long nightmare. But more on that next time.